This course gives an overview of the many aspects of high cycle fatigue in metallic structures. Understanding of (possible) causes of a fatigue crack is the main focus such that the student will be able to recognize, analyse and prevent fatigue problems. Fatigue cracks and failures due to alternating stresses often appear unexpected and can cause a large amount of damage, human as well as material and financial (e.g. liability). The share of fatigue damages of the total amount of mechanical damages is substantial so managing fatigue related problems in an appropriate way is essential. A fatigue failure may have different causes, such as the material quality, production process and possible mistakes, structural (detail) design, erroneous use of strength and reliability analysis, underestimation of the load spectrum and abuse of the product. It is obvious that many aspects do affect the resistance against fatigue. Managing, analysing and preventing problems due to fatigue should be considered as a key capability of a structural engineer. 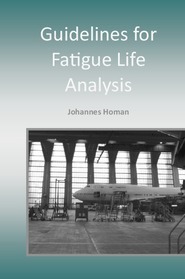 Participants will get the book “Guidelines for Fatigue Life Analysis” for free! Fatec Engineering offers the possibility of customized in-company courses, e.g. a customized selection of topics and/or customized mixture of class training and webinars. After all, the course that fits your daily needs will be the most appropriate for you. With a customized in-company course you can select the topics that meet your requirements the best. Course fee: € 695 (excl. taxes). Location: Near The Hague, The Netherlands. If you are interested in joining the course, please fill in the form below. A course date will be fixed as soon as we expect to have sufficient attendees to the course. You will be informed about course date and exact location by mail and will get the opportunity to register.